"After a contentious campaign season filled with divisive rhetoric, we are now hearing from our members and in the news media about incidents of bigotry and harassment within our communities. From children acting out in schools to adults participating in violent acts, it is clear that our nation is struggling in the wake of this election. "During times like these, our nation's 120,000 public, academic, school, and special libraries are invaluable allies inspiring understanding and community healing. Libraries provide a safe place for individuals of all ages and backgrounds and for difficult discussions on social issues. Our nation's libraries serve all community members, including people of color, immigrants, people with disabilities, and the most vulnerable in our communities, offering services and educational resources that transform communities, open minds, and promote inclusion and diversity. "As an association representing these libraries, librarians, and library workers, the American Library Association believes that the struggle against racism, prejudice, stereotyping, and discrimination is central to our mission. As we have throughout our 140-year-long history, we will continue to support efforts to abolish intolerance and cultural invisibility, stand up for all the members of the communities we serve, and promote understanding and inclusion through our work." Three Lives & Co., the iconic New York City bookseller that had been in danger of having to relocate after the building it has occupied since 1983 was put up for sale earlier this year and then sold in September to Oliver's Realty Group, "will stay put indefinitely, under conditions that both landlord and tenant confirm are sustainable for the long term," New York magazine reported. Although neither party would discuss the terms of the new lease, Three Lives' owner Toby Cox "was buoyant when New York called to confirm the news, and added that working out terms with his new landlord was 'a delight.' The Oliver's team, he says, was 'very aware that Three Lives was important to the neighborhood' and of the particular challenges that a business like his faces," New York wrote, adding that Oliver's managing partner David Wine echoes the same idea in the letter Cox is sending out to his customers: "We know how beloved Three Lives is in the West Village and we're thrilled to provide it with stability." Cox told Shelf Awareness the new lease "gives the shop long-term stability.... My staff and I are thrilled, look very much to continuing to serve the great neighborhood of the West Village. I'm kind of speechless right now. It's just amazing." September bookstore sales rose 1.7%, to $1.161 billion, compared to September 2015, according to preliminary estimates from the Census Bureau. This marked the second straight month of gains after July's 0.9% dip, which was the first drop in bookstore sales after 10 months in a row of gains. For the year to date, bookstore sales have risen 4%, to $9.001 billion. Total retail sales in September rose 3.8%, to $447.8 billion. For the year to date, total retail sales have risen 3%, to $4,040 billion. Note: under Census Bureau definitions, the bookstore category consists of "establishments primarily engaged in retailing a general line of new books. These establishments may also sell stationery and related items, second-hand books, and magazines." John Makinson is retiring from his position as chairman of the Penguin Random House board of directors at the end of this year. 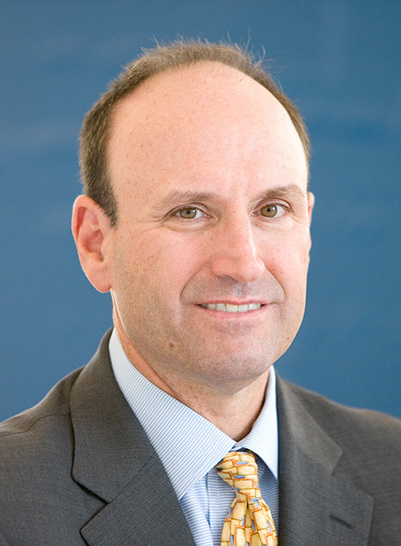 His successor will be Philip Hoffman, former chief corporate finance & strategic development officer at Pearson and current member of the PRH board. Hoffman assumes his new position effective January 1, 2017. In a letter announcing the move, PRH CEO Markus Dohle described Makinson as "one of trade book publishing's most accomplished leaders and champions. As chairman and CEO of Penguin Group prior to the merger, he led one of the world's most successful and admired publishers. He was an early advocate for the Penguin Random House merger and an integral member of the team that brought us together. 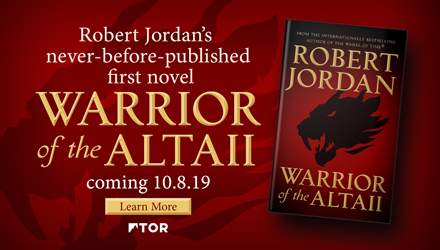 I am one of many who have benefited from his generous support and passion for our books, and I would like to thank him for his immense contributions to our young company. He has been a deeply valued partner to me, as well as to our shareholder board and our publishing colleagues. The completion this year of our post-merger integration is a fitting close to his tenure." Dohle noted that Hoffman "brings to his role a wide-ranging portfolio of experience in book publishing, having worked in various positions at both Pearson and Penguin since 1988, including as chief financial and administrative officer for Penguin Group from 1997 to 1998. Most recently, until his retirement earlier this year, he was responsible for Pearson's strategy, development, and corporate finance activities. I have greatly enjoyed working with Phil on the board and have the highest regard for his straightforward and collaborative approach and his commitment to supporting us in reaching our greatest potential, both creatively and commercially." 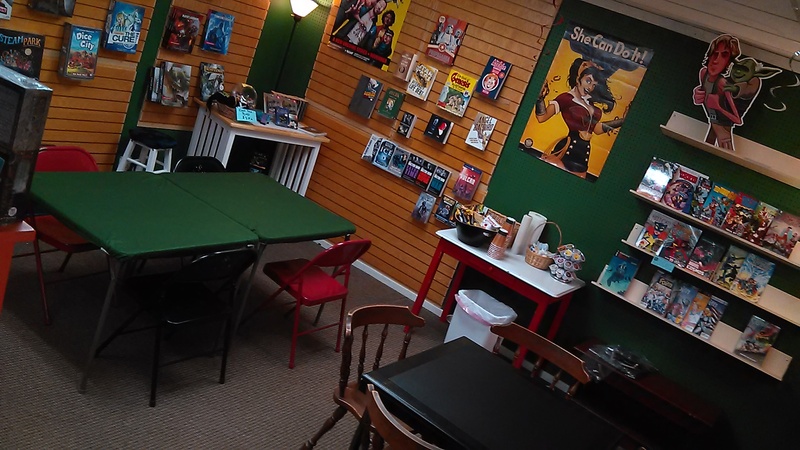 Aaron's Books, Lititz, Pa., has opened a game store called Of Dice & Pen, a "shop within a shop" that focuses on "European style" table-top games, role playing games, graphic novels and single issue comics, as well as books and gifts from a variety of sci-fi, fantasy, anime and other pop-culture fandoms. Of Dice & Pen includes open gaming tables where customers can test demonstration copies before buying, and the staff will teach new games on Saturday afternoons. Three games featured in the next several weeks include Monarch, Mystic Vale and Inis. In addition, Of Dice & Pen will host more Dungeons & Dragons games, family game nights, game tournaments and author and game creator events. Sam Droke-Dickinson, co-owner of Aaron's Books, is manager of the new shop, and will be helped by her teenage son Aaron, for whom the bookstore was named when it opened in 2005. The store will celebrate the new space with prizes and discounts for fans and gamers the weekend of November 25-27. Aaron's Books said it will continue to be the community's local, independent bookstore, carrying new and used books, and now "reach a new audience at the same time." Simon & Schuster is acquiring Adams Media, which specializes in general and niche nonfiction, from F+W Media. The deal should close before Thanksgiving. 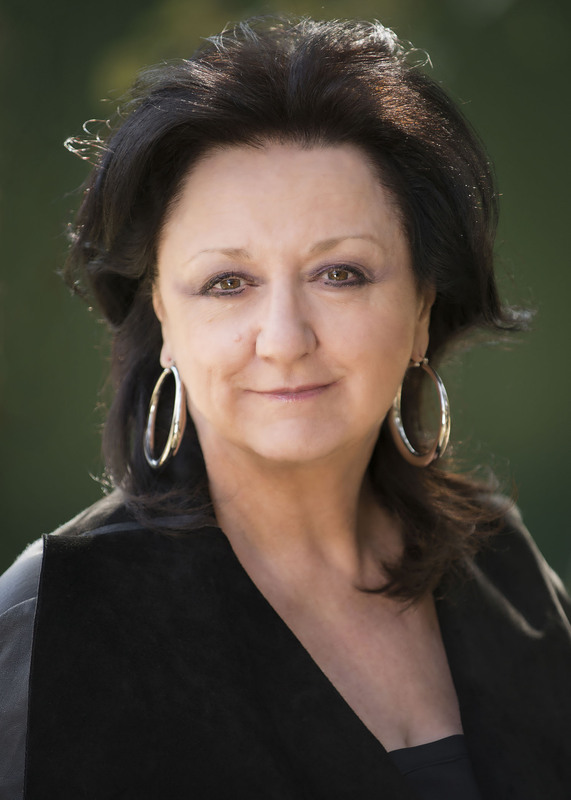 Karen Cooper, currently v-p, books and content of Adams Media, will lead the new Adams Media imprint as v-p, publisher, and report to S&S president and CEO Carolyn Reidy. Adams Media will continue to have its headquarters in Avon, Mass. Founded as Bob Adams, Inc., in 1980, the company was renamed Adams Media Corporation in 1995 and was purchased by F+W Media in 2003. Among its biggest hits are The Everything Kids' Science Experiments Book, Bushcraft 101, Life Hacks and Dude, You're Gonna Be a Dad! Adams publishes approximately 200 frontlist titles per year and has a backlist of more than 1,200 titles. Besides its Everything series, Adams Media's major publishing categories are self-help and wellness, business and personal finance, parenting and cooking. Reidy said that Adams Media has been "particularly adept at identifying audiences and then publishing books to fit that audience's needs, usually with an eye toward a long backlist life. In the process, Adams Media has created a unique and distinctive library of content that we look forward to bringing to a wider audience." Roger Hobbs, author of the acclaimed debut novel Ghostman (2012) and Vanishing Games (2015), died Monday. He was 28. Gary Fisketjon, his editor at Knopf, said: "This is a shocking, tragic loss. Roger accomplished so much as a writer in so little time, and his future was sure to be extraordinary in ways we'll now never know. And as his friend I'm doubly devastated." 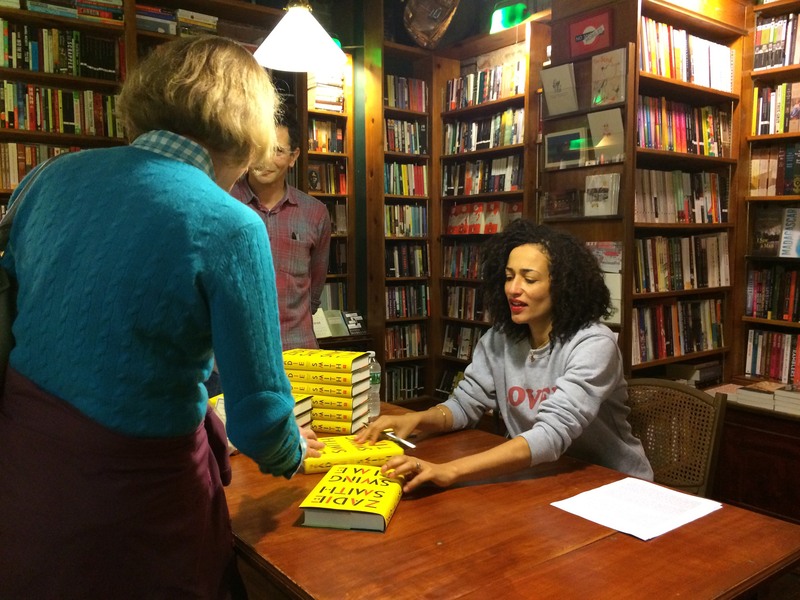 Diesel: A Bookstore in Larkspur, Calif., hosted Amy Novesky and Sara Gillingham, author and illustrator, respectively, of the Love Is children's book series (published by Cameron + Company. Pictured: (l.-r.) Emma Kallok (marketing & publicity manager, Cameron + Company); Amy Novesky (Cameron Kids editor); Sara Gillingham; Nina Gruener (Cameron Kids publisher) and her daughter Imogen; and Clare Doornbos, a bookseller at Diesel. "Post Apocalyptic fiction has been moved to our current affairs section." 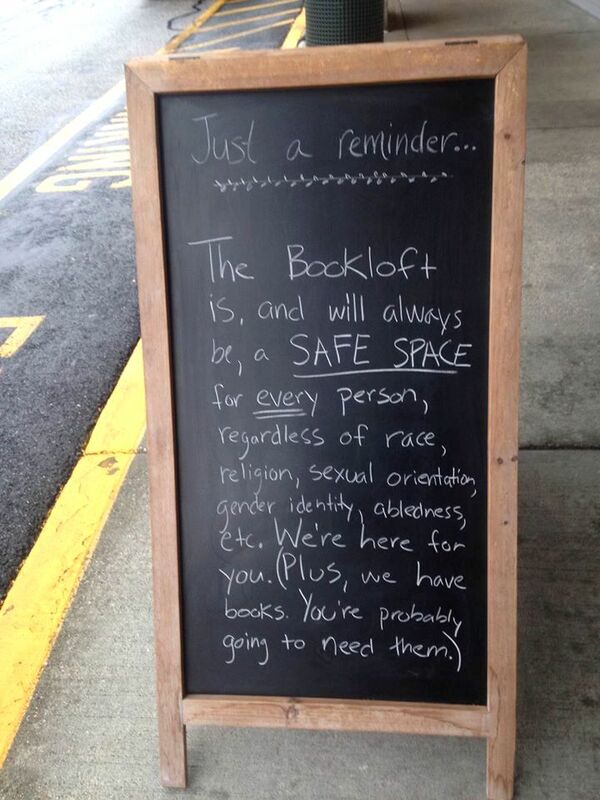 A photo of the chalkboard quickly went viral internationally, and the Bookloft followed it up with a pic of the back side of the board with a pertinent message for the times: "A big, warm welcome to our many new followers in the wake of our chalkboard sign post! We're glad to be able to offer some laughter during these hard times, but never forget that a room filled with books (and the people who love them) also offer unconditional comfort. This is the OTHER side of that chalkboard sandwich board. Whether laughing or crying, and no matter who you are, you are welcome here. Come read with us!" The Fate of the Tearling by Erika Johansen (Harper), the final volume in the Queen of the Tearling trilogy. Fresh Air: Francis Ford Coppola, author of The Godfather Notebook (Regan Arts, $50, 9781682450529). Diane Rehm: John Grisham, author of The Whistler (Doubleday, $28.95, 9780385541190). CBS's the Doctors: Deborah Ziegler, author of Wild and Precious Life (Atria/Emily Bestler, $26, 9781501128516). The View: Megyn Kelly, author of Settle for More (Harper, $29.99, 9780062494603). Also on the View: Simone Biles, co-author of Courage to Soar: A Body in Motion, A Life in Balance (Zondervan, $24.99, 9780310759669). She will also appear on the Late Show with Stephen Colbert. The National Geographic Channel "has released first-look photos of Geoffrey Rush and Johnny Flynn in character as Albert Einstein in the upcoming 10-part anthology series Genius," based on Walter Isaacson's book Einstein: His Life and Universe, Deadline reported. Flynn portrays the scientist in his early years, with Rush taking over as Einstein's career reaches its prime. The series will air in 2017 in 171 countries and 45 languages. Adapted by writer Noah Pink, the project's cast also includes Emily Watson, Michael McElhatton, Seth Gabel, Samantha Colley, Richard Topol and Vincent Kartheiser. Ron Howard and Brian Grazer's Imagine Television, Fox 21 Television Studios, OddLot Entertainment and EUE/Sokolow produce. Howard will direct the first episode, his first time directing a scripted primetime drama. Crystal Wilkinson's novel Birds of Opulence won the $10,000 Ernest J. Gaines Award for Literary Excellence, which is presented annually by the Baton Rouge Area Foundation to recognize "outstanding work from rising African-American fiction writers while honoring Louisiana native Ernest Gaines' extraordinary contribution to the literary world." The Gaines Award shortlisted three books for commendation this year: The Side of Providence by Rachel M. Harper, Triangle Ray by John Holman and We Love You, Charlie Freeman by Kaitlyn Greenidge. 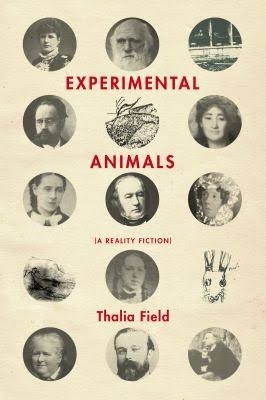 Thalia Field's sixth book, Experimental Animals (A Reality Fiction), is published by Solid Objects (November 1, 2016), a work of historical fiction that explores the 19th-century origins of the laboratory (and experimentalism in science and the arts) through the dysfunctional marriage of physiologist Claude Bernard and his anti-vivisection activist wife, Fanny. Field has three previous collections with New Directions press. Kamel Daoud's The Meursault Investigation. This book is an extraordinary work of literature that proves the dialectic and living nature of art, and how artists are never isolated from conversation through the work. The Law Is a White Dog by Colin Dayan. I'm fascinated by this incredible work on the legal construction of persons, and how these questions affect everyone, animal and human alike. Lao Tzu: Tao Te Ching, a new translation by Ursula K. Le Guin. This is one of my favorite books to read and reread and this new translation is lovely. Dr. Seuss as read to me by my grandmother. I think the rhymes went in deep and never left. As did the attention to the world's absurdities. Harriet the Spy by Louise Fitzhugh. Cliché but true: I actually got my first notebook because of this book. All Creatures Great and Small by James Herriot. I may have read this 15 times. If I could stand the sight of blood, I would have been a vet. Archy and Mehitabel by Don Marquis. First read to me by my father, it became my favorite of all verse forms for many years. Every Peanuts cartoon I could get my hands on--self-explanatory. The Painted Bird and Being There by Jerzy Kosinski. I remember years later reading about a scandal or something about Painted Bird. At the time, it was the most affecting book I'd read. The Sirens of Titan and Cat's Cradle by Kurt Vonnegut. This writer seemed to understand the logic of the absurd universe, and how humans barely grasped any of it. Collected Poems by E.E. Cummings. My favorite poet for many years. It may have resulted in many pathetic imitations on my part. Then I basically started listening to Bob Dylan and hundreds of songwriters, both in popular music and those who wrote musicals, as though they were writing the greatest literature. 1. Virginia Woolf, most especially for her hybrid work Three Guineas, which gave me all sorts of permission about argument through literature. 2. James Joyce permitted me to experiment with language, clowning, absurdity. 3. Ralph Ellison showed me the beauty of politics and abstraction, and that they are not always opposed. 4. Nathalie Sarraute permitted me to do away with description and allow for the voices. 5. Samuel Beckett: Humor. Absurdity. Human foible. It's all there. 1. 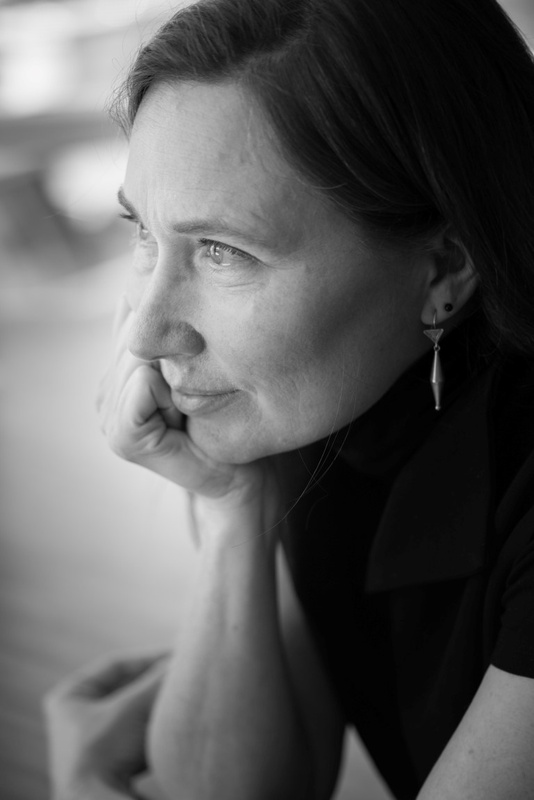 Anakana Schofield, one of the most engaged and humorous writers today. 2. Renee Gladman. Thinking through gesture, language, abstraction and human mystery: she's incredible. 3. Mac Wellman, pure joy of language, and the politics of absurdity (or absurdity of politics). 4. John Weidman. Permission for paragraphs and sentences that span all time. 5. John D'Agata, who gives generous examples of imaginative essays, combining poetry and research into large structures. Vicki Hearne's books Adam's Task and Bandit. I recommend these more than anything else because our relationships to animals are so confused. Hyperbole and a Half by Allie Brosh. Bought for the cover, stayed for the genius. The I Ching. I started throwing and reading almost by accident. Then 10 years went by and everything (and nothing) changed. Guildenstern: Death is the ultimate negative. Not-being. You can't not-be on a boat. Guildenstern: No, no, no--what you've been is not on boats. My worn copy of Gertrude Stein's Collected Works. At least once a week I have to go reread something. My falling apart copy of James Baldwin's The Fire Next Time. At least twice a year I have to go reread. My ancient copy of Howard Zinn's A People's History of the United States. I don't even know who I'd be without this book. Banksy's Wall and Piece. I have to be able to incorporate the belief in public space and public art as a constant possibility. Andy Warhol's The Philosophy of Andy Warhol. It makes me laugh and reminds me I don't know who I am at all. John Cage's Silence. I can't quite regain the sense of total wonder and permission that reading this book first gave me. Its wisdoms and humor haven't lost their edge, though. When History Is All You Left Me opens, the love of 17-year-old Griffin's life is already dead. Theo was Griffin's best friend, boyfriend and first everything. Now Griffin has to face both Theo's funeral and Jackson, the guy Theo started dating after he left New York and went to California for college. Griffin hates Jackson--they even deliver competing eulogies--but begins to realize that he's the only other person who understands what it was like to date Theo and lose him. The novel bounces back and forth in time between the giddy start of Griffin and Theo's romance and Griffin's current devastation. Author Adam Silvera (More Happy Than Not) is wrenchingly good at writing about grief. He captures the huge, howlingly lonely feelings of loss, but also the little things, like feeling guilty for enjoying a song or wanting to watch TV: "I just want to know when it'll be possible to laugh again," thinks Griffin. "And when it'll be okay." As Griffin tries to make sense of life without Theo, and his conflicted feelings about Jackson, he is also dealing with worsening OCD. He has to be on the left side of anyone he's with, he scratches his palms and tugs his ear when he's stressed, and he needs things to happen in even numbers. Griffin's parents are accommodating but concerned about Griffin's needs. Theo, however, always saw the OCD as something a little bit magical about Griffin--something that makes him special. Much of the book consists of Griffin's internal talking to Theo, so we get a full sense of the churn of his mind and the rawness of his heart. We also get a wonderful shifting portrait of Theo. He starts as an idealized figure of handsome genius, effortlessly making up stories about a whole alternate universe of zombie pirates just from the illustration on a puzzle box. We gradually, along with Griffin, become aware of flaws that were there all along, such as Theo's tendency to be self-absorbed and thoughtless. The most deftly written character is Wade, the third member of a best-friends squad with Griffin and Theo. At first, Wade seems like a standard best friend character, threatened by Griffin and Theo's romance and a convenient shoulder to cry on. But he's fleshed out a single brushstroke at a time, becoming rich and engaging. Even though he's the odd man out, Wade often has the best understanding of Griffin and Theo's relationship. And while Theo is good with flashy gestures, it's Wade who knows Griffin well enough to get him a keychain of his favorite Harry Potter character, Cedric Diggory. History Is All You Left Me doesn't sugarcoat grief. Theo's death is going to be painful for a long time. But the novel quietly shows how dealing with loss will help Griffin see himself and his world more clearly. It's a painful coming of age, but a beautifully written and very satisfying one. --Ali Davis, freelance writer and playwright, Los Angeles, Calif. 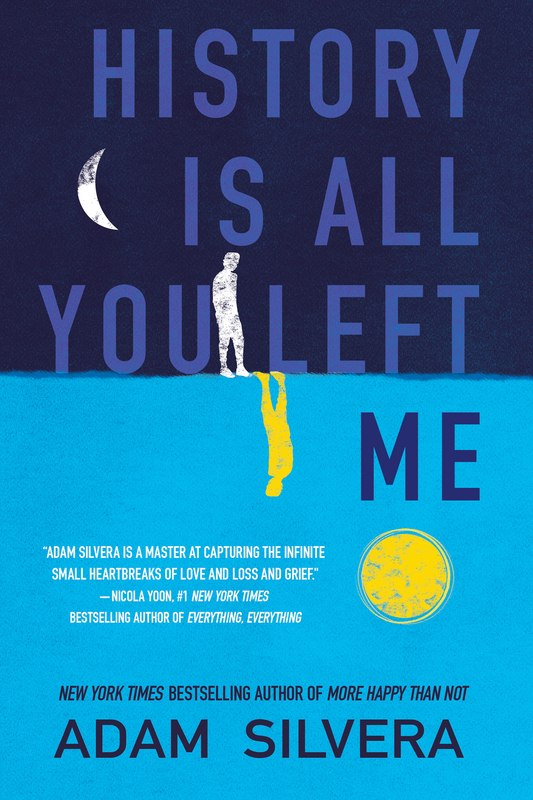 Shelf Talker: In Adam Silvera's second novel, a young man blown apart by grief slowly learns to put himself back together, perhaps as a better version of himself.